First of all, the rest of the United States gets it wrong. It is most definitely going “down the shore”. When you get there, you can go” to the beach” or sit “by the seaside”, but Philly gets it right, as usual. I don’t get a chance to go “down the shore” much anymore. Day trips work at times, but extended stays have been few and sometimes, I have to give into my limits, but I’ll do that kicking and screaming. However, as a kid, going “down the shore” meant Longport, New Jersey. Sure, it had no boardwalk, it wasn’t large, it had one miniature golf course, it had four stores, one bar, and was missing from 1st to 10th Street. However, Longport was perfect. We actually spent a week in 1965 in an second floor apartment in Ocean City. Not enough beds, so I got to sleep on a webbed chaise lounge. Ouch. The very back room was actually locked to us, as someone else stayed there. Creepy. We started going “down the shore” in 1966, first year renting a house for a couple of weeks on Winchester near 32nd Street. Packed a lot of people in that house; the family of seven, grandparents, uncles, aunts, hangers on, cats, dogs. However, you cannot be at the “shore” without traveling to get there first. That’s what this fine memory blog is about. The actual sand between your laptop keys will come later. Transporting cats to the shore was the most challenging thing I ever did. When you hear the term “herding cats”, don’t laugh, it is amazingly difficult. Dogs were fine. They loved the open window, sat on your lap, lapped in the wind, and occasionally threw up on the back floor. However, cats were different. We didn’t buy a carrier. I instead used my young genius filled mind to devise a contraption that included a laundry baskets secured with a piece of cardboard and a rope. Later, it included some towels on the bottom, because cats piss a lot when they are caged. Forgetting that baskets were plastic and that cats could chew and claw through them, we usually got halfway down by the time the cat would eat its way out and dive for the open car window. And halfway down was a long ride, because even when they finally opened the Atlantic City Expressway, my Dad insisted on taking the Black Horse Pike. 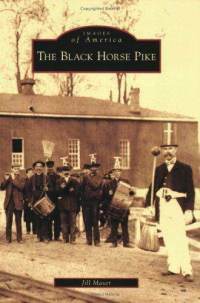 The very long and traffic light filled Black Horse Pike. The Black Horse Pike in the mid-Sixties was transforming from what you may have seen in many 40’s and 50’s films as representative of how people traveled distances. Small motels, roadside stands, long stretches of Pine Barrens, cops hiding behind billboards, quaint little Mom And Pop shops and dubious “tourist attractions” lined the road at the time. We would leave about 8 AM on a Saturday morning and arrive “down the shore” around Sunday dawn. That may be an exaggeration but not much. Starting with the old “odor” from the Whiskey refinery at the base of the Walt Whitman Bridge, down Rt. 42 to when it met the Black Horse Pike in Williamstown, and on down the pike, driving was not high speed. We learned to be creative for “necessities”. We played the usual car games. And there was a small hole on the floor by the back seat of the car. This was for when we could not find a bathroom. Hey, I was 10 years old. My aim was true. We packed snacks, but you KNOW that we just had to stop on the way down. This was before a lot of the fast foods places started popping up, so we ate at some small stands like STEWART’S ROOT BEER, some local luncheonettes, and great diners like GEETS and WILLIAMSTOWN. We know this, because we stopped at them with more regularity than EX-LAX. There were also a lot of really cool (at least for kids) distractions like STORYBOOKLAND and ADVENTURE VILLAGE, small amusement parks that looked much bigger and thrilling to small eyes that to our more jaundiced bigger eyes. Miniature golf courses galore, many looking a little worse for wear, but all more charming than the PUTT PUTT and overgrown courses of today. 18 holes, maybe we got a hole-in-one that got us a free game that may or may not have been used and the prerequisite ice cream (or frozen custard) to celebrate our accomplishments. Yeah, we played games and sang the songs. My parents in the beginning controlled the radio, therefore, we heard their stations, usually WIP-610 before they went sports talk. We had a station wagon with a rear facing seat, so if you traveled this road around this time, you may have gotten some taunting from us. Or maybe you felt the sting of our imaginary bullets as we escaped from your villainous clutches. Gas was like 2 cents a gallon or something, and the stations pumped it, offering things like RED BALL SERVICE. Maybe you got a cold glass bottle of Coke out of an old cooler, but no mini-marts. Plenty of roadside produce stands with amazing fruits and vegetables, and with plenty of signs lining the road as you approached them. Just picked strawberries, ice cold watermelon, and my cornie-corn on the cob. Not a lot of farm animals, so we could not moo at the moo-cows or marvel at the horses. As much as we wanted to, we never caught the Jersey Devil in the Pine Barrens. Since we were kids, we pictured him much like the Tasmanian Devil of Warner Cartoons fame, spinning around like a Jersey dervish. When we saw drawings of how people knew it looked, and it was different from what we believed, so of course, we ridiculed those accounts. We also passed the old Atlantic City Race Course when it was still young. We never went in, we just imagined a real Hollywood versions of gamblers and jockeys. AC Race Course was also the scene of a rock festival that had many of the same rock bands in 1969, just a couple of weeks before Woodstock. 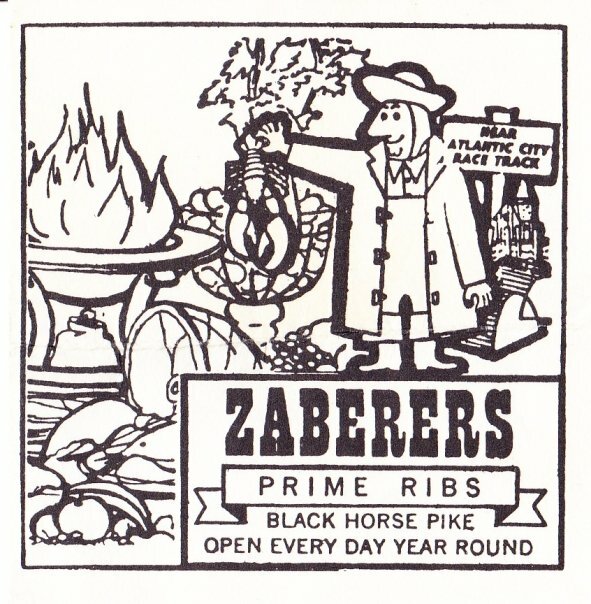 The final place of wonder was a huge restaurant called ZABERER’S. We never stopped there on these drives, but just passing the place made us wide-eyed and dreaming. To us, it was a huge amusement park that happened to serve dinner. Always crowded, always jumping, and always decorated wonderfully. It probably took two hours for a meal, but in those days, before so many interstates, it was the journey and not necessarily the time elapsed that mattered most. Coming soon, Tales of my summers in Longport or the other shore towns themselves. Hint: I hated the beach during the day.